If you visit Cameroon, you must hike Mount Cameroon! Mount Cameroon, with its 10,000 foot summit is a live volcano (so live that there was a brief explosion a few weeks ago). Temperatures on the volcano change from humid hot to freezing cold as one traverses across savannah and rain forest. Contrary to popular guidebooks, this trek is not for the weak of heart or out of shape. We decided on a simple one-day hike due to time, money, and lack of interest in hiking! Though I am always interested in experiencing new things, I know my limits. We utilized the local and trustworthy agency, HADY Guiding Services, to coordinate the trip. Peace Corps Volunteers have been using the agency for years. Lucky for us, Walters Chin, the owner of the agency, offered to walk with us himself. In Cameroon, there is a proverb “On est ensemble” which translates into “We are together.” People use this in everyday situations to say goodbye and you see it displayed in various acts. As we were taking a rest break at Hut 1, a dozen guys came trekking down the mountain. It turns out that they were members of a soccer team and one of their teammates had tried running the marathon, but passed out near the peak. He ended up sleeping overnight on the mountain and every single one of his teammates climbed the mountain to see if he was well and to climb back down with him. It was “on est ensemble” to the extreme. Just wonderful. The mountainous trek was interesting and doable, but we were ready for some black-sand beach time! Just an 800CFA and 30 minute taxi drive away, we headed off to Limbe with the first stop being Mars Restaurant for ice cream from a New York-imported machine. We walked along Down Beach doing a photoshoot before meeting up with a dozen other PCVs at the fish market. I highly recommend the Down Beach's fish market where shrimp and calamari can both be had! Delicious! The Race of Hope is a marathon up Mount Cameroon in Buea, Cameroon. Each February, a few hundred runners ascent 26.2 miles up and down the 10,000 foot volcano in search of challenge. I’ve run three Los Angeles Marathons, but typical American marathons don’t compare to the Race of Hope. During regular marathons, there are thousands of people supporting you. It doesn’t matter if it’s Mile 12 or 22, there will always be someone cheering you on perhaps by name if the respective marathon prints it on your running bib. In the Race of Hope, there are spectators for the first 6 miles or so, and then it’s just you and the mountain. American marathons have bands playing at major intersections, fifth-graders giving you Gatorade, and porta-potties serving as life-savers. I even had a Verizon wireless volunteer run next to me and dial my parents’ number while I said hello after a mile mark. Take all that away and it’s just crazy you running up a live volcano. So it was one of the best decisions that I made to come watch as a spectator because I like marathons, but I don’t like mountains. At 6:30AM, a fellow Peace Corps buddy and I headed to Upper Farms to scout out a great rock to sit on while watching the race and cheering on our crazy friends that were running the relay. The Race of Hope has a relay portion in which three people split the race: Person A will run to tag Person B who will run to tag Person C. Person C will run up to the peak and then on the way back down will pick up Person B before they both pick up Person C. If that doesn’t make sense, just know that all three runners meet back up to cross the finish line together! Originally, only men were allowed to run the relay, but thanks to Peace Corps Volunteer Zachary Drefus, this was the first year that women could run the relay as well! Upper Farms (the bottom base of the mountain) was a huge block party! Hundreds of people came to watch the marathon while meat got cooked, music was played, and drinks were had! Mind you, this was 8AM in the morning! Perhaps the most inspiring and innovative part of the race this year was that blind and visually-impaired runners from the Buea Rehabilitation Institute for the Blind (aka Bulu Centre for the Rehabilitation of the Blind) were accompanied by their family members or volunteers up and down the mountain for the 10k race. Even a 10k up this mountain was crazy as there are parts where you physically cannot run and are forced to walk because it’s so steep. Way to go! As the rain came down and we huddled underneath the prison awnings (Upper Farms is Buea's prison center and ironically, where most people wait to watch the Race of Hope), the crowd immediately roared! It was nobody else but "The Queen of the Mountain" Sarah Etongue. Seven-time winner of the marathon, everybody came out to see her as after the moment she passed, 3/4 of the crowd disappeared! She didn't win this year due to sickness, but her legend easily continues. We soon learned that they eventually stopped letting people summit because the conditions were too cold to run in. Yes, nothing like the sunny marathons I took part in while in Los Angeles! That night we celebrated our friends' achievement with an all-you-can-eat buffet of chicken, fish, vegetables, and surprise crepe desserts at Cuisine Royale. A great race and a great day! *For those interested in learning more about the Race of Hope, please see the documentary Volcanic Sprint. Buea, Cameroon, capital of the Southwest region, was a German colony during the early 1900s. As it is located at the base of Mount Cameroon, the city holds a comfortable cool climate with just a small hint of humidity. We started the morning at Heartland, a Western store selling everything from Snickers bars to Pantene Pro-V shampoo. The winning products that filled my basket? Nothing else but peanut butter and Ramen of course! We walked up the street to The Strand where Sean Denny ordered the spiciest white bean combination I’ve ever tasted. Note: When in the South of Cameroon, you always need to ask if the food is spicy! It usually is. On a whim, we decided to head out to the tea plantations towards the beaches of Limbe. Luckily we stumbled upon a tour agency who told us it was only 200CFA (~$.40US) to Mermox Hotel and another 200CFA to the tea plantations. The taxi driver was extremely nice (as were we!) and we convinced him to drive us all the way to the tea plantations no questions asked. At lunchtime, we headed off to Red Lobster. Yes, there is a Red Lobster here in Cameroon, but no, it’s nothing like the ones in the US! I ordered fried rice and chicken for 1.000CFA (~$2US) before Sean and I headed off the University of Buea. What impressed me about the University of Buea is that it strikingly resembles an American university from architecture to landscape. There are dorms (though they are for the more “spoiled” children according to Sean’s university friend), lecture halls, and tennis courts. Very impressive down to the wireless internet and all. I wish we could have found out what this was for! The rest of the evening was spent helping the Southwest Peace Corps Volunteers prepare for the HIV/AIDS awareness booth for the Race of Hope Marathon the next day. Can’t wait to see the runners! Yes, Valentine's Day even makes its way to the smallest parts of West Africa. L'hotel Adamaoua, located next to Touristique Agency, opened up in December 2011 and easily takes the "Best Hotel in Ngaoundere" Award in this local's eyes! With European-imported furniture, the hotel goes for a trendy and posh modern look and unlike most West African hotels, there are clean tiles everywhere! Luckily by word from the organizer of the Miss Youth Day Ngaoundere competition, I headed out for the February 14th celebration on the hotel's rooftop with a couple other PCVs and my Lebonese friend. While waiting for our meal, I realized that I hadn't been on a rooftop in almost two years. The celebration was perfectly organized as there were comedians, breakdancers, salsa and waltz dancers from Fecadansa, and models from the University of Ngaoundere's Modeling Club strutting their stuff on the runway. It was nice to have a little getaway that night! This garland is made from pink toilet paper! Welcome to Youth Day! And most importantly, welcome to the Miss Ngaoundere Youth Day Beauty Competition*! Held at Alliance Francais, this year was the first Miss Ngaoundere Youth Day competition. They asked me to help out, but unfortunately I was meeting with the Governor when the pre-competition training occurred. It looked like the contestants didn't need help though as they were all-stars! Beyond the typical sportswear, evening gown, bathing suit, and Q&A portions, there was also a "traditional outfit" portion where the girls wore clothing from their respective villages. Have a look! Congratulations Miss Youth Day of the Adamawa! *Note: As a former beauty queen, I can say that we much prefer the term beauty competition in lieu of beauty pageant! Each year on February 11th, Cameroon observes National Youth Day celebrating who else, but the youth of the country! Leading up to the holiday is a week full of activities from sports tournaments to talent shows. Today was the official Youth Day Exposition sponsored by the Ministry of Youth Affairs at the main high school in town, Lycee Classique. 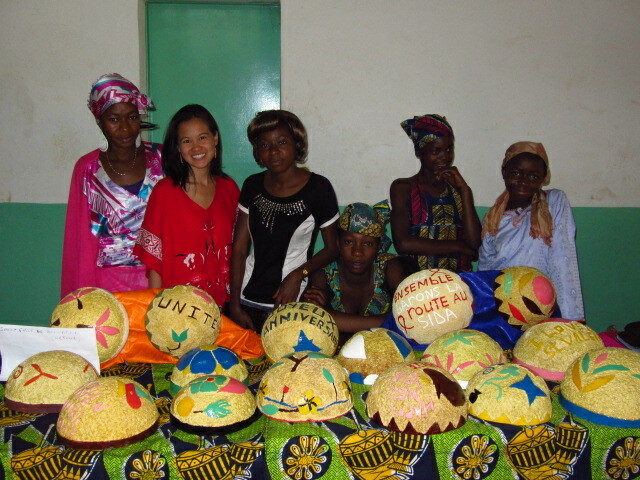 The teacher and girls that I work with to design and sell calabashes showed up for the day long exposition. While there, I taught the girls various marketing and sales techniques. Beyond the publicity created, a fellow high school art student also committed to helping the girls with composing more intricate designs. The best part of the day? As the Delegates and government officials took a tour of the room, they announced that the girls' booth had won the first place prize! The 4.000CFA (~$8US) prize will go towards the girls reimbursing their micro-loan. Well done girls! The finished calabashes! The girls are still learning how to carve them, but they're learning quickly! Youth Day is one of the best Cameroonian holidays because the kids get so excited and thus, everybody else does as well. Click here to read about one of the best Peace Corps memories I have from last year's Youth Day. The session was spoken completely in Fulfulde, the main local language, with the women and Red Cross staff members trading off stories and clarifying myths. Everyone was highly participative and the session went well (of course with the exception that we started two hours late because of "African time! ").